Jacob and his sister Emily learn valuable lessons of faith, obedience, forgiveness, and thanksgiving, along with the real reason why we celebrate and decorate for Christmas. Each lesson is taught in a holiday setting giving the reader a mental picture of each of these lessons. Forgiveness is taught in ‘A VALENTINE FOR JESUS’. Faith can be understood in ‘THE LAMB AND THE EASTER BUNNY’. 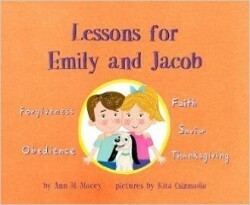 The benefit of obedience is considered in ‘JACOB LEARNS OBEDIENCE’. Being thankful in all things is realized in ‘LET’S THANK GOD FOR TURNIPS!’, and the true meaning of Christmas becomes clear in ‘THE NAILS ON GRANDMA’S TREE’. The Dove Foundation has awarded this book the “Faith-Friendly” Seal for all ages and 5 Doves for it’s high quality storytelling. This entry was posted in Book, Featured by Ann. Bookmark the permalink.